I really didn't like Brookdale Lawrenceville at all. It seemed old, very dark, and gloomy. I didn't see any people moving about or engaging in any activities. It didn't seem like a friendly place. The staff members accommodated me very well and were all very nice. They seemed to have lots of different areas, like a library, but you didn't see people using these things. The dining area was very neat and clean. However, this community wasn't right for us. Thank you for taking the time to visit and provide feedback. Our staff is committed to providing the highest-quality service and care and we will share your feedback with our management team. I like that Brookdale Lawrenceville is affordable, nice, and clean. My mom is picky, but she likes the food there. There are flavors she's not used to, but they always have something else available. They have activities like trivia, sing-alongs, board games, and they have an in-house salon too. They didn't have a companion suite, but my parents really wanted to have their own living room and bedroom so they cut a door in between two apartments because they're right next to each other. Sometimes my mom doesn't like the extravagant food or is unfamiliar with the dishes. Sometimes they want the seniors to participate even when they dont want to do something. I visited Brookdale Lawrenceville. It was pretty decent and nice. I was there for about 20 or 30 minutes; the staff seemed knowledgeable. The rooms seemed nice and good enough for one person. At the time of my visit, they were watching TV and stuff. It seemed like a nice place, and they seemed that they do a lot of activities. Brookdale Lawrenceville was OK. They were certainly willing to work with us, bargain on price I would say, and help us figure a way to make it affordable. The food was just OK. The rooms were good, and the staff was certainly good. If there is one thing they can improve on, it would be the quality of the food. We deeply regret that we were unable to meet all of your expectations. We want to thank you for taking the time to visit and for providing feedback. We will share your concerns with our dining management team to better serve our residents and their families in the future. Emeritus at Courtyard Gardens had a really comfortable feeling to it. I felt at home; everything is relaxing. The staff just kind of felt more like friends or a home-type feeling which was really good. A friend of mine referred Courtyard Gardens. It is very good and Dad likes it there. The people are nice and they do a lot for the seniors. Once a month, they have a men’s lunch out. The room is beautiful and he loves it. Dad enjoys the food overall, though he really likes lasagna. They have therapy on site, ice cream socials, and exercise balloons. His room has two big windows overlooking the courtyard and he really likes it. Dad was just disappointed with the transportation to churches. They have people come in, but it’s not church. They don’t offer services to go to church. Emeritus is very good and the maintenance director is responsive. The facilities are kept up to date. I was pleased with the overall condition of the facility. The staff was great; they are warm, responsive, and helpful. My room is very nice, comfortable and just the right size for me. We have games and trips. We also have sing-alongs and entertainment from musicians who come in. I would recommend it to anyone who needs a little help; the assistance part is very good. I met the activities director of Emeritus at Courtyard Gardens, and her schedule was really good. We went there twice, and it was during a mealtime. We didn't eat, but people were eating because I did want to see how they were served and how people were sitting, so that was all good. Everything looked good and smelled good, so I am sure it was fine. Activities were posted, the activities director was upbeat, and everybody was kind. That was what I saw happening. All of their staff was especially friendly; everybody spoke to us. Everybody, even people we passed in the hall, was nice. They were smiling, courteous, and they all looked like they were happy sitting at work. Nobody seemed grumpy. Everybody was doing their job, and everybody seemed very content. There were visitors that we met there, and they were happy, and then they were like, "Oh, your mother will like it here. I love coming here." So I had positive feedback even from people who were visiting their relatives there. Mom went to Emeritus at Courtyard Gardens. The facility is very warm and friendly. They encourage the residents to participate in the activities. Their rooms are nice and big. The staff are very caring. I like the warm atmosphere when I go there. They are unique because their residents have formed a welcoming committee, so when a new resident comes in, that committee takes them under their wings and shows them around and answers questions. They do memory games, dominos, and bingo. They also do a little basketball. They also have arts and crafts. I would recommend this place. I don't think there's much to change in Emeritus at Courtyard Gardens. From what I've saw, it didn’t feel like a typical rest home environment. I liked the atmosphere, it seemed like a pretty well kept and run place. The residents seemed content and happy there. My dad's accommodation is very nice and suitable for him. The staff is very friendly. They offer him laundry, daily check-ups, medication and ensuring he gets the meals. I tried the food, it was good. There are lots of activities going on for the residents. They have sing-a-longs, exercise, bingo and crafts. Another thing I'm impressed with is the resident nurse that they have all the time. She's new, but there's another one that has been there for all her career as a nurse. It tells me that it’s the place one wants to me, not just the residents but the staff included. Emeritus was a very nice facility but it didn?t fit our needs at this time. We only visited the main area, they didn't have any vacant rooms at the time. The dining room was very nice, it was large. What I liked best was the fact that it was a small facility, not huge and also that it was close into the Lawrenceville area. The staff was very professional. Emeritus at Courtyard Gardens was a very nice place. The backyard area looked like a beautiful park. The facility itself was a bit small which was better as it was more intimate. The food was fine and was specifically geared to the elderly as they don't put a lot of sodium and stuff like that. Courtyard Gardens is a great place and the price was right too. It's less expensive, but it was nice. My father likes it. He likes the food and the people. The staff were great. They have an apartment and it's very nice. Courtyard Gardens is excellent. The facility is clean, the staff is friendly and accommodating. The facilities looked nice enough, but they could add a few more activities and social events for people to participate in. People often seem bored. Our friend is very upbeat though for medical purposes he needs assisted living. The caretakers seem pretty nice, and he tells us he is treated equitably. I wish he had a few more friends there, but maybe in time he will get a few more. The facility was clean, though it did smell some as most assisted living facilities do. I think it is a good fit for him, but I would like to see him moved to a more all-inclusive type of experience that provides him with a fuller day-to-day life experience. I visited Courtyard Gardens in Lawrenceville, GA. to see for myself the facility and the programs it offers its residents. I was impressed by the home.The staff seemed to genuinely care about the residents. I worked for a different facility many years ago and because of how terrible it was, I was hesitant to ever have a loved one placed in a home. Courtyard Gardens was different. The residents I encountered seemed happy and most were busy doing activities of one sort or another. They get taken on trips, play games, participate in fitness activities, create gifts for their loved ones in crafting classes, and stuff like that. By the end of the visit, I felt very satisfied with the quality of the establishment. If you have fears and impressions of what you think an assisted living home is like, I encourage you to check out Courtyard Gardens. I visited Courtyard Gardens in Lawrenceville, GA. to check out the facility and the programs it has to offer its' residents. I must say that I was impressed by the home. It had an "at home" feel to it and the staff seemed to genuinely care about the residents. I worked for a different facility many years ago and because of how terrible it was, I was hesitant to ever have a loved one placed in a home. Courtyard Gardens was recommended by a friend who convinced me that this residence was different from those of the past. I was pleasantly surprised to see that she was right. The residents I encountered seemed happy and most were busy doing activities of one sort or another. They get taken on trips, play games, participate in fitness activities, create gifts for their loved ones in crafting classes, etc. By the end of the visit, I felt better knowing that there was a place available for my parents (should it ever be needed) that had a the feel of home and a real since of community. If you have fears and impressions of what you think an assisted living home is like, I encourage you to check out Courtyard Gardens. I don't believe you will be dissapointed. If you are looking for small, intimate, quaint, stately and elegant, nestled quietly off the beaten path, beautifully landscaped with your favorite flowers, and all the comforts of home, then you will love our community! We welcome you to Courtyard Gardens. 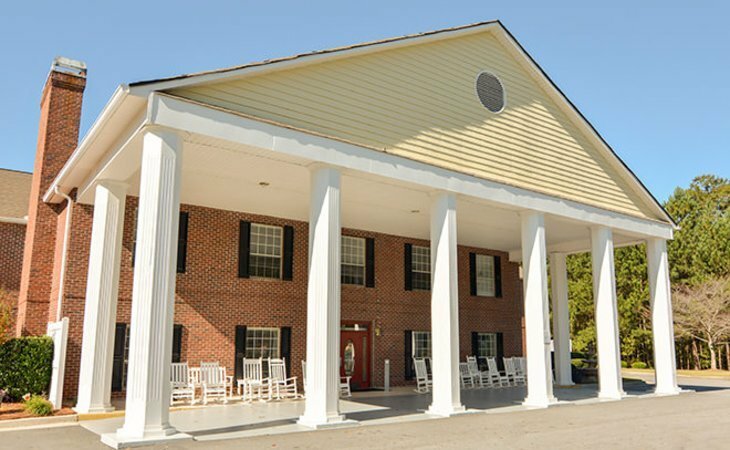 What should caregivers and potential residents know about Brookdale Lawrenceville?